Self-governing individuals are necessary to have a self-governing society. That is, only a moral and disciplined people are capable of being governed by a limited government. Those who are not need greater government. The Pilgrims taught us this when they established the successful colony in Plymouth. Self-governing individuals are necessary in order that the United States can hope to maintain a government of constitutional limits and of a size and scope that can be accountable to the people. But good government depends on the character and virtue of the people it represents. But the more fundamental debate that is going on in this country is the one which speaks directly to the character of each individual. And that debate is ultimately the one over religion and its proper role in our society. Character is defined by the set of moral qualities that a person possesses or one’s moral strength. Character is the inner strength to do what is right even when no one is looking. There is a deeply-embedded understanding in this country, stemming from our very founding settlers, patriots, and Founding Fathers, that religion and morality are fundamentally linked. Morality has roots in religious doctrine. In the Old Testament, God handed down a series of commandments to guide man’s conduct. Man is free indeed, but even the Bible teaches that he should not be free to do everything he pleases. And so we have the Ten Commandments (on which common law, including criminal law, has been based). In the New Testament, God has established a new covenant with all who believe. And so we see a strong them of forgiveness, compassion, selflessness, and love in those books. Jesus himself summed up his Father’s commandments in two great commandments: the command to love God with all one’s heart and mind (see Deuteronomy 6:5), and the command to love the neighbor as the self (see Leviticus 19:18). Morality sees its roots therefore in the desire to always do good and do what is right. Religion provides the motivation and the reason to do good. It provides meaning to live a moral life. Thomas Paine believed that the moral duty of man consists in imitating the moral and beneficence of God. Our Founding Fathers saw morality as dependent on religious principles rather than on some internal value system because they believed that morality is based on timeless truths. Despite the various religious beliefs of our Founders, they shared a strong common belief that moral truths exist and are necessary for people to responsibly self-govern their own affairs. And that’s why we see the historical record full of advice from them to remain a moral and religious people. Lasting virtue is never forced; it is not passed in our genes. It is born out of a respect for certain fundamental and eternal truths based on right versus wrong, good versus bad, fair versus unfair. It is born out of love and deep respect for one’s fellow man and for the rights that he values for everyone. And so we see that the debate has intensified over whether religion is critical to self-government. I would argue that there is no element more important to one’s individual behavior than the influence of religion and the power of the conscience. And that’s why I believe that our Founders intended for the government to encourage the full expression of religious rights and not try to prevent it (using its arbitrary “Wall of Separation” to chill that expression). Unfortunately, all too often we hear that government and schools aren’t supposed to legislate or teach morality. But if we look at the roots of government and the purpose of law, we find out that the exact opposite is true. When Cicero wrote that true law is “right reason,” he assigned it an objective, universal quality. To Cicero, reason is the most divine of all human characteristics as it is reason that separates man from all other creatures that God created and is therefore the one quality that man and God have in common. As he wrote: “That animal which we call man… full of reason and prudence, has been given a certain distinguished status by the Supreme God who created him; for he is the only one among so many different kinds and varieties of living beings who has a share in reason and thought, while all the rest are deprived of it.” Because law comes from right reason, and reason is divine as one human aspect that connects us to God while separating us from the rest of the creatures on the planet, it stands to reason that the law that comes from reason contains a divine element as well. In the second part of his quote, Cicero claimed that law is also “in agreement with nature.” What Cicero meant by this is that law is in agreement with our nature as human beings. Cicero was assassinated by order of Marc Antony some forty years before the birth of Christ. It is interesting that Cicero taught the same message that Jesus himself would teach in his short time on Earth. Religious principles and biblical precepts were central to the success of the American experiment. The belief in God and his creation was at the very core of their belief in Natural law and the natural ordering of society and liberty. It was their belief that allowed them to gravitate towards the government philosophy of John Locke, on which our nation’s values were based. Religious principles form the basis of the ideals stated in the Declaration of Independence, the ordered liberty embodied in our Constitution, and the conviction we have as a nation to recognize the inherent dignity in all human life and to send our brave men and women all over the globe to fight for the rights of others. Religious principles were, and still are, essential to the security of the freedom we claim to stand for and to the foundation that grounds our nation’s founding ideals. In short, the great American Experiment was founded on religion and needs that support if posterity is to enjoy what is promised in the Declaration of Independence. James Madison said that men should conduct themselves as if they “have a duty towards the Creator.” (See his 1786 Memorial and Remonstrance). “This duty is precedent, both in order of time and in degree of obligation, to the claims of Civil Society,” he wrote. Thomas Paine and Benjamin Franklin, two of our most important Founding Fathers, did not necessarily see eye-to-eye on religion. Franklin was raised in a devout Puritan home and Paine was a Deist. As a deist, Paine believed that God created the world but then allowed it to operate according to natural laws. Deists believe God does not intervene in the lives of his human creations. Rather, morality should come from reflecting on benevolence of God in creating such a perfect and finely-ordered world. Franklin, on the other hand, believed strongly in an active, ever-present God. Although Franklin was raised in a devote Puritan home, he did not fully embrace the Calvanism of his upbringing. As an adult, he put his faith in an active God who watched over his natural creation and could, on occasion, intervene in the lives of his human creation as well. … You yourself may find it easy to live a virtuous life, without the assistance afforded by religion; you having a clear perception of the advantages of virtue, and the disadvantages of vice, and possessing a strength of resolution sufficient to enable you to resist common temptations. But think how great a portion of mankind consists of weak and ignorant men and women, and of inexperienced, inconsiderate youth of both sexes, who have need of the motives of religion to restrain them from vice, to support their virtue, and retain them in the practice of it till it becomes habitual, which is the great point for its security. And perhaps you are indebted to her originally, that is, to your religious education, for the habits of virtue upon which you now justly value yourself. You might easily display your excellent talents of reasoning upon a less hazardous subject, and thereby obtain a rank with our most distinguished authors. For among us it is not necessary, as among the Hottentots, that a youth, to be raised into the company of men, should prove his manhood by beating his mother. In other words, he argues that because God is active in the affairs of man, there is pressure for men to keep virtuous. Religion, he explains, is a check on the pernicious tendencies of man. The small progress we have made after four or five weeks close attendance and continual reasonings with each other, our different sentiments on almost every question, several of the last producing as many ‘nays’ and ‘ays,’ is methinks a melancholy proof of the imperfection of the Human Understanding. We indeed seem to feel our own want of political wisdom, some we have been running about in search of it. We have gone back to ancient history for models of Government, and examined the different forms of those Republics which having been formed with the seeds of their own dissolution now no longer exist. And we have viewed Modern States all round Europe, but find none of their Constitutions suitable to our circumstances. In this situation of this Assembly, groping as it were in the dark to find political truth, and scarce able to distinguish it when presented to us, how has it happened, Sir, that we have not hitherto once thought of humbly applying to the Father of lights to illuminate our understandings? In the beginning of the Contest with Great Britain, when we were sensible of danger we had daily prayer in this room for the divine protection. Our prayers, Sir, were heard, and they were graciously answered. All of us who were engaged in the struggle must have observed frequent instances of a Superintending providence in our favor. To that kind providence we owe this happy opportunity of consulting in peace on the means of establishing our future national felicity. And have we now forgotten that powerful friend? I have lived, Sir, a long time, and the longer I live, the more convincing proofs I see of this truth- that God governs in the affairs of men. And if a sparrow cannot fall to the ground without his notice, is it probable that an empire can rise without his aid? We have been assured, Sir, in the sacred writings, that ‘except the Lord build the House they labour in vain that build it.’ I firmly believe this; and I also believe that without his concurring aid we shall succeed in this political building no better than the Builders of Babel: We shall be divided by our little partial local interests; our projects will be confounded, and we ourselves shall become a reproach and bye word down to future ages. And what is worse, mankind may hereafter from this unfortunate instance, despair of establishing Governments be Human Wisdom and leave it to chance, war and conquest. I therefore beg leave to move, that henceforth prayers imploring the assistance of Heaven, and its blessings on our deliberations, be held in this Assembly every morning before we proceed to business, and that one or more of the Clergy of the City be requested to officiate in that service. Roger Sherman, delegate from Connecticut, seconded the motion. While many refer to the 55 delegates to the Constitutional Convention and those men, like Thomas Jefferson and John Adams, who drafted the Declaration of Independence as our “Founding Fathers,” the term (or group) actually includes many others, such as those whose actions and writings led to the American Revolution. However, for this discussion, it is worth noting that this core group of 55 delegates to the Constitutional Convention represents the general religious sentiments of those who shaped the political foundations of our nation. As confirmed by public record, the delegates to the Convention included 28 Episcopalians, 8 Presbyterians, 7 Congregationalists, 2 Lutherans, 2 Dutch Reformed, 2 Methodists, 2 Roman Catholics, 1 unknown, and 3 deists (those who believe that God created the world but then allowed it to operate according to natural laws. Deists believed God did not intervene in the lives of his human creation). Overall, 93% of the delegates were members of Christian churches. And all – that is, a full 100% – were deeply influenced by a biblical view of mankind and government. Where did our biblical view of mankind and government come from? It stemmed from the Christian roots of our thirteen original colonies. Beginning in the seventeenth century, settlers from Spain, France, Sweden, Holland, and Great Britain claimed land in the New World and formed colonies along its eastern coast. Spain controlled the West Indies. The French owned land from Quebec all the way down to the end of the Mississippi River in New Orleans. And the British colonized most of the Atlantic coast from Massachusetts down to Georgia. In 1620, the Pilgrims followed and set up a colony at Plymouth, in what is now Massachusetts. Many of the Pilgrim women and children didn’t survive the first winter. Yet they refused to return to England and they refused an opportunity to live in the Netherlands. They wanted the opportunity to establish a political commonwealth governed by biblical standards where they could raise their children and live according to the teachings of Christ. The Mayflower Compact, their initial governing document, clearly stated that what they had undertaken was for “the glory of God and the advancement of the Christian faith.” William Bradford, the second governor of Plymouth, said: “The colonists cherished a great hope and inward zeal of laying good foundations for the propagation and advancement of the Gospel of the kingdom of Christ in the remote parts of the world.” Plymouth became the first fully self-governing colony. In June 1630 the Puritan colony of Massachusetts Bay was established. In that year, Governor John Winthrop landed in Massachusetts with 700 people in 11 ships to serve God and establish a pure church – pure in worship and in doctrine. (The Pilgrims and Puritans wanted to establish a new land where they could live the teachings of the gospel). Massachusetts Bay would begin the Great Migration, which lasted sixteen years and brought more than 20,000 Puritans to New England. While still on his ship, the Arbella, Winthrop wrote the sermon he would deliver to the new colonists as they were ready to set out and establish their first settlement. The sermon was titled “A Model of Christian Charity.” In that sermon, he sought to articulate the reasons for the new colony. He talked about avoiding a shipwreck. “Now the only way to avoid this shipwreck and to provide for our posterity is to follow the Counsel of Micah, to do Justly, to love mercy, to walk humbly with our God.” The “shipwreck” that he referred to was the wrath of God that falls on peoples or nations who fail to do God’s will. To avoid the shipwreck, they would have to establish a truly godly society. Winthrop talked about the need to love one another and serve one another – to be merciful, kind, compassionate, sharing, and selfless. This part of the sermon was clearly reminiscent of the Sermon on the Mount. But the sermon would be remembered for the term he used to coin the Puritan experiment – “A city upon a Hill.” These words would not only inspire the Puritans that traveled with him, but they would also be used by American presidents hundreds of years later to yet again inspire Americans to greatness. These were the words that Winthrop delivered to his fellow Puritans as they were ready to disembark from the ship: “For we must consider that we shall be as a City upon a hill. The eyes of all people are upon us. So that if we shall deal falsely with our God in this work we have undertaken and so cause him to withdraw his present help from us, we shall be made a story and a byword throughout the world.” Indeed when people vow to live according to religious principles and devote themselves to promoting their faith, they invite scrutiny. They place themselves under a microscope, where all too often those who are looking through the lens are looking to find criticism. William Penn was inspired by 1 Thessalonians 4:9 when he established Pennsylvania. (“But concerning brotherly love you have no need that I should write to you, for you yourselves are taught by God to love one another.”) To emphasize his plan to have a place where Christians would work together, he planned and named their city “Philadelphia,” which is Greek for “City of Brotherly Love.” His concept was that religion is not to be limited to a Sunday ceremonial ritual, but should be an integral aspect of everyday life, demonstrated by working with others in love and respect. Perhaps William Penn was inspired by the Puritans. The Puritans believed that religion should form the foundation of their society, in government, education, and work ethic. The Puritan work ethic placed a high moral value on doing a good job because work has such high intrinsic value. To the Puritan, all of life was to be lived in relation to God, a principle which gave sacred significance to every activity. Work was valued as a vital part of their service and worship to God, and they took the Bible seriously when it said: ‘And whatever you do in word or deed, do all in the name of the Lord Jesus, giving thanks to God the Father through Him.’ (Colossians 3:17) Just as the Israelites were instructed to work six days and then rest on the seventh (Exodus 20: 9-10), the Puritans regarded work and worship as a lifestyle of obedience to God. From the first colony at Jamestown to the colonies in Massachusetts to the Pennsylvania colony, the Bible was used as the inspiration and the rule of life and governance in the settlements. The evidence of the profound effect of God’s word and teachings of Jesus Christ on our early Americans and early leaders is overwhelming. We’ve enjoyed so much freedom for so long that we forget how and why we are able to so enjoy it in the first place. Men and women crossed the Atlantic not to find fertile fields and enjoy successful harvests, but rather to secure liberty for their souls. And specifically, the freedom they were seeking when they established their colonies and their charters was the freedom to worship freely and to live as they wanted to, according to God’s laws. The founding and settling of our great country rests on a simple truth. People flocked from all over the world in search of the freedom to establish colonies where they could openly live and govern themselves according to their religious dictates. They didn’t come here to have Sunday service with their family. They came here for the freedom to incorporate the teachings of the Bible intimately in their everyday life, everyday speech, everyday conduct, everyday worship, and in their very government. The Bible even inspired them in the manner in which to establish their communities. Our earliest settlers, the Pilgrims and Puritans, in particular, carried the secret to successful self-government with them across the Atlantic. Their greatest contribution was the notion that only a religious and moral people could be trusted to govern themselves successfully. Only a religious and moral people could be trusted with liberty. Our children are taught in school that the Pilgrims were a group of stoic, starched creatures in black and white clothes with shiny buckled black shoes and hats who had a successful harvest which inspired them to share their bounty with the Indians, who had helped them become successful farmers. They are the group that gave us Thanksgiving. Our children are never taught the real legacy of the Pilgrims. The truth is that they were devout, hard-working, family-loving, persevering people who were committed to establishing a successful colony based on self-government and religious freedom. The Pilgrims were part of the Puritan movement (a separatist movement, from the Church of England). They became spiritually aware when the printed English Bible became available. They could read the gospel of Jesus Christ firsthand and not have to wait to hear scripture read in the Church, headed by the King of England. This relatively small band of men, women, and children had a strong desire to serve God as they saw fit, free from the Church of England and the religious policies of the King. Being identified as “separatists” or “purists” made them potential traitors to the Crown and made them outcasts. In order to exercise religious freedom, they would have to leave England, settle in Holland (perhaps one of the only places they could be free from persecution) for eleven years, and eventually make their way back to England to commission a ship to take them to the New World. They faced many trials and tribulations along the way, including imprisonment. Finally, the Pilgrims were able to commission two ships to take them to the New World, one being the Mayflower. Shortly after departing, however, the second ship took on a leak and had to return to England. As a result, not all of the Pilgrims were able to make the journey. When the Mayflower finally reached the coast of Massachusetts, in 1620, the Pilgrims and members of the crew signed a compact, the Mayflower Compact, before departing the ship. The Compact expressed their desire to be rid of British law and to establish a form of self-government based on just and equal laws and for the advancement of the Christian faith. In the New World, government would be established to serve their interests and they would be masters of their government, unlike in England, where the government was the master of the people who exist to serve the interests of government. The “Matrix of Liberty” is structured and built to show the interdependence of these truths. The center of the monument is a giant women holding a Bible and pointing to the Heavens. She is Faith. At each of the four corners of the base of the monument is a pillar, representing Morality, Law, Education, and Liberty. The pillars have a certain order, starting with Morality and ending with Liberty. Looking at the monument in sequential fashion, one can understand the ordered foundation of the Pilgrim society. Faith – She is pointing to God because her faith is in the God of the Bible and in Jesus Christ. She is holding the Geneva Bible which is open, indicating that she is actively reading it. She has a star on her forehead to signify that she has wisdom, which comes from the Bible. She believes in Jesus Christ, who was sent to Earth to set man free. The first pillar is faith. Faith is necessary for all the other pillars. Morality – The statue is of a woman with no eyes, holding a Bible. She has no eyes to signify that morality is an internal characteristic. Morality means the “heart is right.” To achieve morality, the heart must be transformed according to the word of God. Law – The statue is of a woman holding the scales of justice. There must be some degree of order in society and order is established by a set of laws. Laws are based on God’s law. They protect and promote goodness and punish and prevent evil. Hence, law must be morally just. She is holding the scales of justice to indicate that the law applies equally to everyone. Laws must be fair and equitable. Punishment, for example, must be in set in fair relation to the offense. Finally, society should be merciful, just as God offers mercy and grace. Education – The statue is of a mother teaching her children. She is holding an open Bible and pointing to the Ten Commandments. Parents should educate and train their children in morality and religion so that they will grow up to be responsible citizens, capable of maintaining a free and ordered society. The so-called “Matrix of Liberty,” and the values and priorities it represents, is the real legacy of the Pilgrims. Not the black and white dress or suit with the shoes with the black buckle. Not the hair up in a bun with a white kerchief or the turkey feast. Yet no one celebrates this. Public schools only teach about the successful harvest, and not the successful formula for self-government and religious liberty. We see how American leaders throughout our history have acknowledged and emphasized the importance of this heritage. We see how the belief in America’s Providential destiny inspired almost all of our great patriots and fighting men and women. Take Nathan Hale, for example. Nathan Hale (1755-1776) was a young school teacher when the Revolutionary War broke out in April 1775 at Concord and Lexington. Nathan’s friend witnessed the siege of Boston and wrote a letter in which he said: “Our holy religion, the honor of our God, a glorious country, and a happy constitution is what we have to defend.” Soon after receiving that letter, Hale joined his five brothers and they fought for America’s independence in the Revolutionary War. He quickly rose to the rank of captain. Hale fought under General George Washington in New York at the time British General William Howe was building up his troops on Long Island. Washington took his army onto Manhattan Island. At the battle of Harlem Heights, he asked for a volunteer to go on a spy mission behind enemy lines and it was Hale who stepped forward. For a week, he went unnoticed and gathered information on the position of British troops. While trying to return to the American side, however, he was captured. Because of the notes and incriminating papers that Hale on his person, the British immediately knew he was a spy. Howe ordered the 20-year-old Nathan Hale to be hanged without a trial. “Our dangers are of two kinds – those which affect our religion and those which affect our government. They are, however, so closely allied that they cannot, with propriety, be separated. The foundations which support the interest of Christianity are also necessary to support a government like our own, designed to protect freedom and equality…..
“Almost all the civil liberty now enjoyed in the world owes its origin to the principles of the Christian religion. It is the sincere desire of the writer that our citizens should early on understand that the genuine source of correct republican principles is the Bible, particularly the New Testament or the Christian religion. The religion which has introduced civil liberty is the religion of Christ and his Apostles, which enjoins humility, piety, and benevolence; which acknowledges in every person a brother or a sister, and a citizen with equal rights. This is genuine Christianity, and to this we owe our free constitutions of government. “The voice of experience and the voice of our own reason speak but one language…. Both united in teaching us that men may as well build their houses upon the sand and expect to see them stand, when the rains fall and the winds blow and the floods come, as to found free institutions upon any other basis than that of morality and virtue, of which the Word of God is the only authoritative rule and the only adequate sanction. All societies of men must be governed in some way or other. The less they have of stringent state government, the more they must have of individual self-government. The less they rely on public law or physical force, the more they must rely on private moral restraint. Men, in a word, must necessarily be controlled either by a power within them or a power external to them; either by the Word of God or by the strong arm of man; either by the Bible or the bayonet. “If we and our posterity shall be true to the Christian religion, if we and they shall live always in the fear of God and respect His commandments, if we and they shall maintain just moral sentiments and such conscientious convictions of duty as shall control the heart and life, we may have the highest hopes of the future fortunes of our country; and if we maintain those institutions of government and that political union, exceeding all praise as much as it exceeds all former examples of political associations, we may be sure of one thing… that while our country furnishes material for a thousand masters of the historic art, it will afford no topic for a Gibbon. It will have no decline and fall. It will go on prospering and to prosper. “The most perfect machinery of government will not keep us as a nation from destruction if there is not within us a soul. No abounding material prosperity shall avail us if our spiritual senses atrophy. The foes of our own household shall surely prevail against us unless there be in our people an inner life which finds its outward expression in a morality not very widely different from that preached by the seers and prophets of Judea when the grandeur that was Greece and the glory that was Rome still lay in the future. His words were given expression when the European movement with which the American people were in most compete sympathy – the French Revolution – had endeavored to destroy the abuses of priestcraft and bigotry by abolishing not only Christianity but religion….. The result was a cynical disregard of morality and a carnival of cruelty and bigotry, committed in the name of reason and liberty, which equaled anything ever done by Tomas Torquemada and the fanatics of the Inquisition in the name of religion and order. Washington wished his fellow countrymen to walk clear of such folly and iniquity. As in all cases where he dealt with continuing causes, his words are as well worth pondering now as when they were written…. As our nation entered the 20th century and assumed its role to protect and enlarge individual liberty around the world, we often wonder how it was that young men could so willingly and selflessly volunteer to fight under the most horrific of circumstances. After World War I, the United States hoped it would never have to see conflict and warfare on that scale again. But on December 7, 1941, with the attack on Pearl Harbor, it was suddenly thrust into a war that was even deadlier, bloodier, and more widespread. 16 million Americans fought in World War II. Over 406,000 died and over 600,000 were injured. What was it that made these men so willing to put their lives on the line for their country? The answer can probably be explained, at least in part, by the story of one young marine, Mitchell Paige. Paige was awarded the Congressional Medal of Honor for his actions at the Battle of Guadalcanal in the Solomon Islands. In that battle, US Marines took control of the airfield from the Japanese. On October 26, 1942, Paige held his position even after all of the other Marines in his platoon were killed or wounded. He continued to operate four machine guns by himself for hours even after the last fellow Marine fell. He single-handedly stopped an entire Japanese regiment. Had the American position been compromised and the airfield returned to Japanese hands, it is possible that the outcome of the war in the Pacific and even the entire war would have changed. In the years following, Paige was repeatedly asked why he was willing to put his life on the line for his country. He repeatedly referred to his “undying love of country.” He said that the answers took him back to a Pennsylvania three-room country school where the children were so steeped in the traditions of America that they literally felt themselves a part of a glorious heritage, where the teacher opened the school day with a Bible verse and the Pledge of Allegiance, and where they memorized all the great documents that established the bedrock of America, such as the Gettysburg Address. He believed he was blessed by God by living in the United States. “This country was founded by men and women who were dedicated or came to be dedicated to two propositions: first, a strong religious conviction, and secondly, a recognition that this conviction could flourish only under a system of freedom. I think it is appropriate that we pay tribute to this great constitutional principle which is enshrined in the First Amendment: the principle of religious independence, of religious liberty, of religious freedom. But I think it is also important that we pay tribute and acknowledge another great principle – that of religious conviction. Religious freedom has no significance unless it is accompanied by conviction. And therefore the Puritans and Pilgrims of my own section of New England, the Quakers of Pennsylvania, the Catholics of Maryland, the Presbyterians of North Carolina, the Methodists and the Baptists who came later… all shared these two great traditions which, like silver threads, have run through the warp and the woof of American history. No man who enters upon the office to which I have succeeded can fail to recognize how very president of the United States has placed special reliance upon his faith in God. 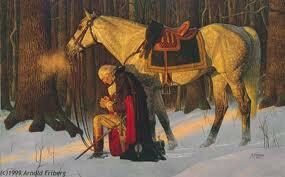 Every president has taken comfort and courage when told that the Lord ‘will be with thee. He will not fail thee nor forsake thee. Fear not – neither be thou dismayed.’ While they came from a wide variety of religious backgrounds and held a wide variety of religious beliefs, each of our presidents in his own way has placed a special trust in God. those who were strongest intellectually were also strongest spiritually. “We establish no religion in this country, nor will we ever. We command no worship. We mandate no belief. But we poison our society when we remove its theological underpinnings. We court corruption when we leave it bereft of belief. All are free to believe or not believe; all are free to practice a faith or not. But those who believe must be free to speak of and act on their belief and to apply moral teaching to public questions. I submit to you that the tolerant society is open to and encouraging of all religions. And this does not weaken us; it strengthens us…. “History is a ribbon, always unfurling.. History is a journey. And as we continue our journey, we think of those who traveled before us. Now we hear again the echoes of our past: a general falls to his knees in the hard snow of Valley Forge; a lonely president paces the darkened halls and ponders his strength to preserve the Union; the men of the Alamo call out encouragement to each other; a settler pushes west and sings a song and the song echoes out forever and fills the unknowing air. What exactly do we mean by “Our Christian Heritage”? We certainly don’t refer to it as a way to suggest that Christianity be the official religion of the United States. We have the First Amendment to protect us from the establishment of any one religion, so that our religious conscience is free from the coercion or criticism of other religions (or non-religion) and no one is forced to support an offensive religion with their tax dollars. Our Christian heritage finds its roots in the very foundation of our government. Its principles and values affect many aspects of our lives, none more profoundly than the very form of government that we enjoy and benefit from. The concept of the sovereign person, being “created in God’s image,” the inherent dignity of every human being, tolerance towards others, charity, service, equality before the law, and personal responsibility all come from the Christian message. Every person, old or young, strong or weak is equal before the Lord. Religion plants the seeds of morality and ethics. It promotes strong families, which are the bedrock of a healthy, ordered, productive society. It gives the representative a servant’s heart. It sets guidelines for conduct that benefit society as a whole. It structures government that is closest to the individual, where it can be most responsive. It establishes notions of fairness and equity. It establishes proper priorities for a strong community. When we speak today of the Christian heritage, we speak of institutions (mostly government) that come from the Hebrews and values that we owe to the Judeo-Christian culture. The basis of our law comes from Natural Law and from God’s Law. In other words, religion provides the foundation of good (personal) self-government so that our governments, federal and state, can effectively resign themselves to their essential tasks and stay out of the lives of its citizens as much as possible. The Declaration proclaimed “to a candid world” that in the United States of America, the power over natural rights vests in the Individual and not in any government. The decisions regarding the exercise of Life, Liberty, and the Pursuit of Happiness, as well as the right to protect and defend them, belong to the People. These individual rights are so important, according to our nation’s Founders, that government’s primary function must be to protect them. Furthermore, in order that government can never assume any power that the People don’t want it to have, the Declaration states that governments are to instituted among Men, deriving their just powers from the consent of the governed. This is our doctrine of Individual Sovereignty. Never before had any country adopt such a progressive idea! Rights had always been enjoyed at the mercy of a King (such as the Magna Carta) or granted as seen fit by governments. In the US, power vests originally and inalienably in the People and as such, the People can reclaim it. This doctrine was offered as justification for the American Revolution and provided the basis for our grand American experiment. The message in the Declaration is clear – the responsibility over government is given to the People and with them alone rests the security of their freedom. “Man, considered as a creature, must necessarily be subject to the laws of his Creator, for he is entirely a dependent being… And consequently, as man depends absolutely upon his Maker for everything, it is necessary that he should in all points conform to his Maker’s will. This will of his Maker is called the Law of Nature. This Law of Nature, being coeval (co-existent) with mankind and dictated by God Himself, is of course superior in obligation to any other. It is binding over all the globe, in all countries, and at all times; no human laws are of any validity, if contrary to this…..
And if our reason were always clear and perfect, the task would be pleasant and easy. We should need no other guide but his (the Law of Nature). But every man now finds the contrary in his own experience; that his reason is corrupt, and his understand full of ignorance and error. This has given manifold occasion for the benign interposition of Divine Providence, which hath been pleased, at sundry times and in diverse manners, to discover and enforce its laws by an immediate and direct revelation. The doctrines thus delivered are what we call the Revealed or Divine Law, and they are to be found only in the Holy Scriptures…. Government’s primary responsibility, as outlined in Article I, Section 8 is to defend the nation from attack, to maintain an Army and Navy, to declare war, to establish a uniform policy on immigration, to coin money, to promote intellectual property (useful arts), to regulate commerce, to establish a post office, and the like. In other ways, thanks to the Bill of Rights and the symbiosis with the Declaration of Independence, government has a pronounced subsidiary role: to help promote Life, Liberty, and the Pursuit of Happiness, to support the work of the families, religious communities, and other institutions of civil society that shoulder the primary burden of forming upright and decent citizens, caring for those in need, encouraging people to meet their responsibilities to one another while also discouraging them from harming themselves or others or misappropriating the property of others. Governmental respect for individual freedom and the autonomy of non-governmental spheres of authority is, then, a requirement of political morality. Government must not try to run people’s lives or usurp the roles and responsibilities of families, religious bodies, and other character- and culture-forming authoritative communities. The usurpation of the just authority of families, religious communities, and other institutions is unjust in principle… often seriously so. And that’s why the record of big government in the twentieth century is not a successful one. It has done very little good in the long run (other than protecting people from exploitation in labor and regulating for the health and safety in food/drugs) and in fact, has caused more harm to society than good. Never before has there been such a deficit of character and morality. Our Founding Fathers knew that if God should ever be taken out of the nation’s value system, our rights as citizens would no longer be absolute and they would instead become subject to the relative values of those who are in a position to make or change the laws… such as Congress, a scheming president, or activist judges. Universal moral laws that promote the good of all people, as individuals (not as a collective), and that protect the innocent and vulnerable are slowly and steadily eroded when government declares that it is not supposed to legislate morality. When that happens, there is necessarily a paradigm shift. There is such a shift because the opposite of morality is immorality. If government doesn’t legislate to serve moral ends, then it legislates for immoral ones. Soon, the government assumes the moral (or immoral) license to do what it thinks best. Much has been written in recent years to try to dismiss the fact that America was founded upon Judeo-Christian Biblical principles. But this is merely part of a larger attempt by progressives to revise our history and use it in the teaching (indoctrination) of our youth to engineer a “new” America – an America not defined by her founding principles and values. This is not to say that all of the Founding Fathers were Christians. Clearly, some were not. But what is most important is that even those who were not Christians were deeply influenced by the principles of Christianity. Those principles nevertheless helped to shape their political ideals. But without a doubt, there was a predominant Christian consensus in colonial America that shaped the Founders’ thinking and their writing of our founding documents and laws and resulted in the republic that we have today. Atheists may complain about and seek to undermine our Christian heritage, but the right to think and express themselves as they do was granted to them by Christians. Atheists want “good without God” and work tirelessly to remove the spiritual underpinnings that form the framework for our rights, our republic, and our laws. But what they don’t understand is that without the belief and social acknowledgement that our individual human rights are linked to our relationship with God (Creator), then our rights are not secure at all. If rights don’t come from a Creator, then they must come from government. And if they come from government, then they are not inalienable and government is free to take them away when it suits their purposes. That’s why atheists can’t hope to establish a society of their own and are dependent upon the values that come from Christianity. When I was a young girl, I spent a lot of time in the Methodist Church across the street from me. My mother worked both a day and a night job and I didn’t like to be home alone. When I saw the lights on in the church, I would pick up my books and go there. Aside from learning about our Savior’s unconditional love and the power of His act of salvation upon the cross, one message that stood out from my time in the church was that we are to love our neighbors as we love ourselves. Another message I took home from my early days in the church was this: “What you have (health, mind) is God’s gift to you. What you do with them is your gift to God.” In other words, there is some sort of personal obligation to invest in oneself, develop talents and gifts, become educated, and use them to contribute in some way in order to benefit society as a whole. And in contributing, one should hopefully be mindful to honor and glorify the Father. In my world, as a young girl, I not only saw religion as a code that established guidelines for conduct and behavior, but I also came to see it as a force that encouraged me to be the best human being possible and to contribute productively to my community. As I mentioned, my mother wasn’t around much and certainly I didn’t see much of my father as well. I didn’t have an authoritarian figure to watch over me night and day. I barely had one for a few hours at the end of the day. Yet I did well in school, never missed a day, never got in trouble, never broke a law, and never caused my mother any grief. Why? Because I was able to govern myself successfully. I had an internal system of laws that restrained my conduct and helped me understand what was right and wrong. Isn’t this what the Pilgrims had in mind? Isn’t this what our Founders had in mind? Imagine if all children and young adults had the same kind of influence in their lives as I had. A few weeks ago, I was fortunate enough to listen to some remarks that Pitt County district court Judge Brian DeSoto delivered to a group of conservatives. He began by reading from the Declaration of Independence: “We hold these truths to be self-evident, that all men are created equal, that they are endowed by their Creator with certain unalienable Rights, that among these are Life, Liberty and the Pursuit of Happiness.” Brian emphasized that the Declaration only recognizes the right to pursue happiness; it doesn’t recognize a right to happiness. As he explained, our Founders were wise enough to understand that the right to happiness was a recipe for disaster. That, in fact, was a government philosophy embraced in Europe but one that was explicitly rejected by our Founders. I got to thinking what these two messages – the Declaration’s use of “pursuit” and the message I took from my church as a young girl – have in common. Both are based on Natural Law; that is, the natural basis of our humanity. They are both grounded on the notion that Man has free will and understands the consequences of his actions. Freedom, like life itself, is a gift. They are precious gifts indeed and ultimately provide us with the opportunity to reach our full human potential. But because they are based on the exercise of free will, we as individuals have to take responsibility. If we want to honor God with our life and our deeds, then we have to make the necessary choices. We have to develop the gifts we are given. If we want to enjoy property and happiness, we must first pursue them, which means we’ll first need to invest some energy, hard work, sacrifice, and perhaps creativity and/or ingenuity. If we wish to preserve our rights as individuals for our posterity, we must take a good look at the government we have allowed to govern us. Success (as embodied in the term “Happiness”) is not always easily achievable. It demands sacrifice. The person who sets out to find success understands that he may also fail. But it is in the “pursuit” that we find the greatest exercise of freedom. And freedom is always worth the risk. Once freedom is gone, people rarely get it back. Going back to Judge DeSoto’s remarks, if our government takes away the right to fail, as it has been doing with its growing entitlement programs, individuals cease exercising their free will. If individuals cease to exercise their free will, government will fill the gap and take away fundamental individual rights. It was the exercise of free will that enabled our 236-year-old country, conceived in freedom and liberty, into the wealthiest, the most productive, the most creative, the most industrious and the most generous nation on Earth. Likewise, it will be the exercise of free will that will determine whether people will live their lives to honor God and help to restore the values upon which our nation was grounded. The results are in….. Everywhere Christianity has been able to penetrate culture and society, it has been successful. It has been so successful that others, such as atheists and extremists, have flocked to Christian empires to enjoy its freedom and prosperity. The humanization that derives from Christianity has touched the heart of civilization and civilization will never be the same again. Here in the United States, our Christian heritage explains our notions of ordered Liberty and government. The preservation of that liberty has always depended on two things: a constitution that limits the amount of government in people’s lives and a citizenry that requires little government. We still have our Constitution to protect us from the reaches of government, although the government has jumped into warp speed to redefine the scope of its own powers and to audaciously exceed the power that was originally granted to it by the States and the People – the true sovereigns. What we don’t have is a citizenry that is disciplined enough and moral enough to require as little government as possible. They have not been using their free will wisely or responsibly. When laws are too numerous, they are just as dangerous to the exercise of liberty as having no law at all. When government and law replace individual manners and morals as the basis for social order, government and the law will fail, and so will society. The task before us is to exercise free will responsibly and in line with certain traditional values so that we can be self-governing citizens capable of preserving liberty and passing that American legacy onto our children and grandchildren. The task is to limit government and recommit ourselves to a decent civil society. If we wish to energize the moral state of the union, government will have to return to the principles of freedom and justice that stand behind the Constitution, and people will have to return to moral principles. They will need to demand that government get out of the way and allow religion to permeate their societies in order to establish moral codes and enable individuals to better govern themselves (so that government doesn’t have to). Only when people can govern themselves successfully can we ever hope of scaling back government and getting it out of our lives and within constitutional bounds. This won’t happen by itself. People will have to stand up and do their part. As Ron Paul warned in his final address to Congress (2012), the American people must return to virtue before the government will trust them with freedom. This statement alone, from a man who liberty-conscious as Dr. Paul, should serve as a wake-up call. He talks about a government “who will trust the people with freedom.” A good and decent, moral people would have the opposite concern. They would question whether they could trust their government with THEIR freedom. I hope Americans can return to good. Raghavan Iyer, Parapolitics: Toward the City of Man, Concord Grove Press, Oxford (1979). Russell Kirk, The Conservative Mind: From Burke to Eliot, Regnery Publishing (2001).